Last year signaled the arrival of an exciting new crime novelist. Arguably the best first novel of the year, Johnny Shaw’s Dove Season didn’t get as much attention as it deserved, perhaps in part because Amazon published it as part of their new Encore line of trade paperback originals. Whatever your feelings might be about Amazon’s business practices or their impact on publishing and bookselling, ignoring the novels they’ve printed and the authors they’ve introduced is a mistake. And in the case of Shaw, you’re only hurting yourself. So, if you haven’t read Dove Season, you should correct that error right away. 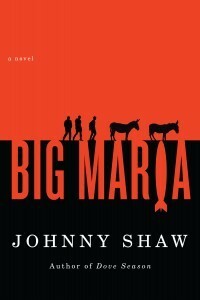 While you’re at it, you should also pick up a copy of Big Maria, Shaw’s second novel that came out earlier this week. For as much as I enjoyed Big Maria, I still think Dove Season is a stronger book. For all its moments of humor and clever turns of phrase, that debut novel allowed Shaw to explore the deeply human aspects of its characters in a more compelling and compassionate way, even if he did call it a “Jimmy Veeder Fiasco.” Shaw’s approach in this new novel represents a dramatic departure. Big Maria is a wild, wild ride of amazing proportions, a low-comedy crime caper that dredges the depths of human folly. Think of the Three Stooges hunting for the Treasure of the Sierra Madre and you’ve got a pretty good idea of the direction this yarn takes. In some ways Shaw’s writing is more polished and confident in this second novel, but Big Maria plays for laughs from start to finish, and despite a few truly touching moments – one in a church comes vividly to mind – this is a deeply silly book. But that’s the whole point. Shaw is actually breaking new ground here by pushing his “ridiculously awesome” aesthetic to its limits. Those familiar with Shaw’s quarterly e-zine Blood & Tacos, now on its third issue, will recognize this terrain. In both Blood & Tacos and now in Big Maria, the familiar, groan-producing tropes of men’s adventure fiction are lovingly and self-consciously parodied to expert comedic effect. By the second half of the book, the bizarre turns become almost expected in their unpredictable way, but Shaw’s still such a talented writer with such perfect comic timing that you’ll keep turning the pages even as the gags get so thick you can barely keep track of them all. I won’t say more because I don’t want to spoil any of the surprises. As a minor note, I feel I should offer a warning for sensitive readers. With Big Maria’s vast collection of gross-out moments and adolescent slapstick, some readers are going to be turned off for sure. Before you buy this one, you might want to read through the first chapter and see if you’ve got the stomach for this novel. Our hero, a not-quite-loveable loser named Shitburger awakens in a drunken stupor to find that not only has he passed out on the toilet in dive bar, but he’s vomited into his own underwear. He ignores the pounding on the stall door and passes out again, this time to awaken next to the dumpster out back. His pants have been pulled up, but they’re still full of cold vomit. If you think this is funny, or could be, grab yourself a copy of this book and enjoy the romp. But if you’re turned off by the first chapter, you should know it doesn’t get any more noble between here and the absurdist deus ex machina ending. I loved Big Maria. It’s page after page of rip-roaring action and gut-busting laughs; however, I also felt like some of the opportunities for real pathos, particularly around the character of Ricky, were forcibly shoved aside so we could get back to the comedy. I know, it’s harder to laugh at somebody getting smacked in the balls when you too closely identify with them as a person. But as a reader I like making that human connection with the characters in a novel, and I missed that here. Still, that’s not where Shaw wanted to go with this novel, and the places he does take us are absolutely beyond compare. My own favorite episode is the encounter with the mountain lion, but I won’t say any more about that or the rest the novel’s gold nuggets of comic action because you’ve really got to experience the splendor for yourself. Johnny Shaw and Big Maria will show you a grand time!